Before iOS 12 Upgrade: How to Backup and Restore iPhone? How to backup iPhone when being requested to by Apple while proceeding an iOS 12 upgrade? - especially when your iCloud storage reaches its limit again. And you would prefer suicide than sitting down by a computer waiting for iTunes coming back to senses till the world ends. But there's a time when iPhone backup is a must - iOS 12 upgrade, and DearMob iPhone Manager gives you a third choice besides iCloud and iTunes. Planning on an iOS 12 upgrade, you already know that aside from the 1.8 GB iOS 12 software size, Apple also advises users to keep at least 1.5 GB of temporary space for OTA iOS 12 upgrade to complete. This would be a nightmare for old iPhone 6/7 users with 64GB or lower storage space to catch up. If you don't have that much free space left and is reluctant to clear up iPhone songs, delete unwanted APPs, or wipe out some photos or video files, you can always selectively backup and restore iPhone later to make room for iOS 12 upgrade first. To back up and restore iPhone before an iOS upgrade secures that there being no risks of data loss. No matter for freeing up device space or as a precaution against iOS 12 upgrade error, iPhone backup & restore can safeguard all your iOS data, including those saved in Apps. In case that you want to downgrade iOS 12 to iOS 11, the archieved backup file can be of great importance. How to Backup and Restore iPhone iPad for iOS 12 without iTunes/iCloud? By and large, users can resort to Apple's native backup and restore iPhone services to manage their data or resort to a 3rd-party one. Here we don't detail much on using iCloud to backup iPhone data or iTunes backup steps, but you may get some help should you have problems using Apple's tools to backup and restore iPhone: check iCloud backup couldn't be completed [solved] , iTunes won't backup iPhone [Solved], and iTunes problems on Windows 10 . How to Backup iPhone Data with DearMob iPhone Manager? Step 1: Download, install and launch DearMob iPhone Manager for Windows and Mac. First USB-connect iPhone to the computer with an authorized cable from Apple. Step 2: By default, this iPhone backup software employs: C:/ > User:/ > AppData > Roaming > DearMob > DearMobiPhoneManager to backup iPhone files, so far you can't change the backup files folder. 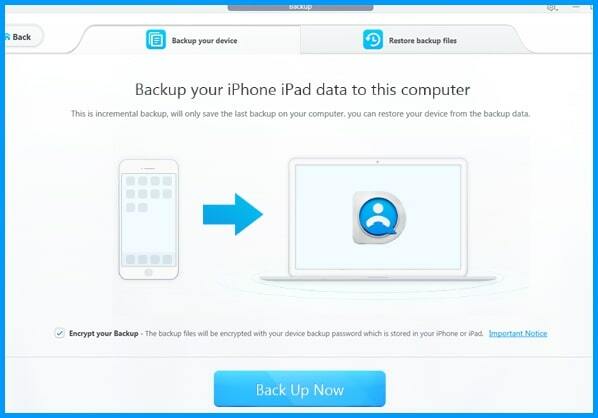 Step 3: Return to the user interface of this backup software, on the line-one of DearMob's functional APPs, click on "Backup" > to the confirm page > hit the "Back Up Now" button to help to start backup iPhone data. 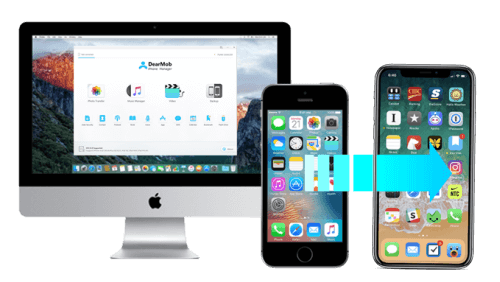 You're more than recommended to use the "encrypt backup" function of DearMob iPhone Manager to password-protect your iPhone data to ensure that nothing gets leaked even if someone else visits your iPhone backup files. Even if you don't feel like restoring from iPhone backup after upgrading to iOS 12, leaving the encrypted backup files are relatively safe on computer. How to Restore iPhone from Backup to iOS 12 without iTunes/iCloud? After tapping on the "Backup" tab, next to the "Backup your device" is the "Restore backup files" tab to help you restore from backup to iOS 12, and here's how to can restore backup files to iPhone. Step 1: Let's assume that you've successfully upgraded iPhone to iOS 12, now re-connect iPhone to computer and switch to the "Restore backup files" tab. 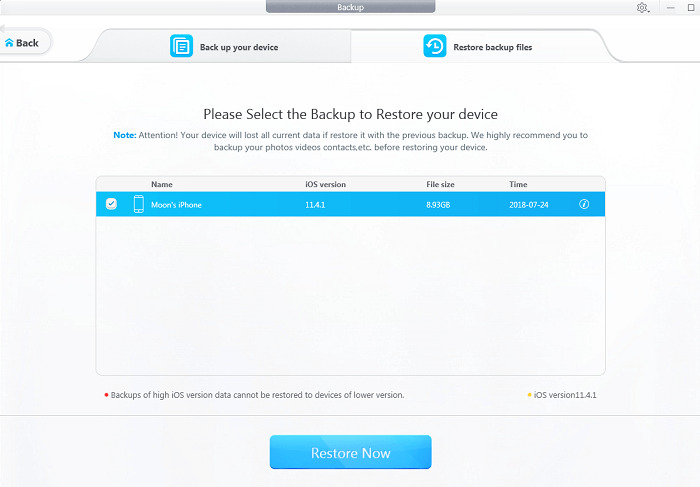 Step 2: Locate to the backup files stored on your computer, choose the most recent version of iPhone backup (or any previous version you'd like to restore to iPhone iOS 12), and click on "Restore Now" below. Step 3: If you're trying to restore from an encrypted backup, make sure you type the correct password for it. Kindly be noted that higher version data can't be restored to devices of lower versions. What Else Can I Do Except for Backing Up and Restore iPhone Data before iOS 12 upgrade? By visiting: "Settings" -> "General" -> "Storage & iCloud Usage" -> "Storage" -> "Manage Storage", you may delete unwanted APP data for good. Kindly be noted that you won't be able to recover data even if you re-install the APP. However, backup and restore iPhone with DearMob iPhone Manager ensures zero data loss. 3. Clear Downloaded Content from Apple Music, YouTube, Podcasts, etc. 4. Delete Safari Viewing Cache and other browsers' cache. 5. Disable the "Live" function for live photos. 6. Wipe out photos from "Recently Deleted" album. 7. Turn on automatically delete text messages. 8. Delete old SMS to reclaim space for iOS 12 -> It's relatively easy to backup SMS with DearMob iPhone Manager. Although the 8 tricks above may help you make room for iOS 12 upgrade, using DearMob iPhone Manager to backup and restore iOS 12 is a method worth trying for you can get everything back without even the slightest data loss. You may also use it to backup photos, backup text messages iPhone, music, etc.